Michal Jakubowsky: Recently you have celebrated Urbano's 10th birthday. What was Urbano like as a puppy? Did you think at that time that he will be so successfull? What distinguished him from other males? Massimo Santini: At first glance Urbano was special as a puppy. He grew up in full harmony with my son Francesco and attracted attention not only due to his head and expression but also because of his self-confident character. He was a dominant one among his litter-mates. So, I have to admit that as a puppy he was somehow "special". If I have to compare Urbano with other famous males that lived with us (e.g Ch. Nero del Diamante Nero, Indio del Diamante Nero, Moro del Diamante Nero and Victor Vito del Rio Bianco) there is no difference in terms of sentimanental value. I loved the same all these dogs for their great advantages as well as for their imperfections. Beyond that, we can say that Urbano is a real "destination" at our kennel, work that we started over 30 years ago in co-operation with Mauro Favero (owner of del Rio Bianco kennel). We can consider Urbano as a "closing" of genetic circle of Diamante Nero and Rio Bianco. First three generations consist of dogs coming from these two kennels and who led us to this result - Urbano del Diamante Nero. M.J: Over the years Urbano has won many shows, which are the most important to you? M.S: For me AIAD Show has special meaning - Urbano achieved twice the title of AIAD Social Champion. Another special moment was BOB and Sieger title at Club Show in Spain under judgement of Dr. Pezzano. There was also BOB at European Dobermann Trophy Winner Show under judgement of Thomas Becht and Norbert Daube. I remember well show where Urbano got CAC along with his famous son Pathos delle Querce Nere and Citto del Diamante Nero. I have great memories from World Dog Show in Poland where Urbano won in working class and got the title of V-ce World Winner. Same day our Iara del Diamante Nero became Youth World Winner so it was a very beautifull day for us. Of course, these are the most spectacular results of Urbano's career but I want to mention an anecdote which many people may not know. It is commonly known that in Italy the highest grade in Youth Class is MB (very good). There were only few exceptions in Italy when Exc (excellent) grade was given to a dog from Youth Class. It happened to Tequila Mali del Citone and to Gamon di Campovalano but Urbano was also qualified as excellent by Florindo Coppo and that was very special for me together with another important victories in his youth age - Giovane Promessa AIAD and IDC Youth Winner. M.J: How many matings Urbano had so far? Can you give some examples of his progeny which have special meaning to you? M.S: So far Urbano had more than 300 matings with females who came from all parts of the world. 2. Fact that at the age of 16 months old Urbano was father of famous Pathos delle Querce Nere. M.J: Having said of Urbano's 300 matings, you probably have complete knowledge about his breeding potential. According to your knowledge, what females are the right ones for Urbano? M.S: Urbano has it's genotype based on Diamante Nero and Rio Bianco blood-line and this is the reason why his progeny are easily recognized in eyes of different experts. Especially because of his head type which can be seen in almost all matings Urbano had till today. From my experience, I had seen and evaluated best sons of Urbano and I have to say that almost always Urbano gave his best in combination with blood-lines from del Citone / Prinz v. Norden Stamm. Results from this combinations have best qualities from both blood-lines and these two lines mixed together are really successfull. I can mention AIAD Siegerin from 2012 - Azzura Borboni del Mitreo (Urbano del Diamante Nero - Sheva Shay del Citone). What's more, over last three years I noticed that some breeders are using inbreeding methods on Urbano's line and it seems to me that it works out pretty well. At this point I need to mention IDC Sieger 2012 - Quickstep King of Darkness (Ale' Alamos del Citone - Come As You Are Vesta) who was born from Urbano's daugher and Urbano's nephew. I think that this method will be widely used by breeders who want to have Urbano's genotype well established in their breeding. M.J: Looking backwards at pedigrees we can notice a tendency of successfull litters between daughters of Nitro del Rio Bianco (e.g Giada di Villa Conte, Rivien & Reny of Tanderberg) with males out of del Citone kennel. Do you think that same trend may refer to daughters of Urbano? Would you recommend to Urbano's progeny owners to consider mating with del Citone males? (Baron Nike Renewal, Fedor del Nasi). I worked hard on this issue and if you pay attention to pedigree of Toscano del Diamante Nero, there are some proofs of my words. To conclude, I have conviction that lines of Diamante Nero / Rio Bianco are really good mix with lines of del Citone and Prinz v. Norden Stamm. M.J: Looking at Urbano's pedigree, what dogs are in great part responsible for Urbano's conformation? M.S: I think Urbano is strongly affected in his genetic by two fundamental males in terms of his genotype. The first is Indo del Diamante Nero who is responsible for strong head and second is Graaf Quirinus v. Neerlands Stam who certainly brought into del Diamante Nero and del Rio Bianco line better general conformation. M.J: Do you recommend inbreeding on Urbano? Yes or no and why? can fulfill combination of Citone-Urbano and Baron Nike/Fedor-Urbano. This is what I think in terms of breeding-strategy. M.J: Nowadays we can observe interesting situation when some of european dobermann breeders are using in their breeding american dobermanns. What do you think on it? M.S: I have spent several years for research of american dobermanns. I can to say that I appreciate their elegance, dryness and almost always good and typical head expression. In the past, there were attempts to combine best american and european blood-lines. Commonly known case of Marienburg kennel which obtained good results from v. Franckenhorst line. This project was continued in 1995 by Dr. Pezzano who decided to cross Tequila Mali del Citone with Holmrun Phabio of Marienburg. On the other hand, almost nobody knows about another attempt which was done with help of great breeder Jenns Kollenberg more than 20 years ago. He exported to America Alida v. Flandrichen Lowen as well as her sister Amida and Kalina v. Norden Stamm. However, in my opinion results in breeding from these females were not as good as their litters in Europe when they were mated with european studs. Of course, this is my own point of view and I don't say that it is absolute truth. Just my personal opinion. In recent years, I can see that these efforts are still present and other breeders are trying to realize this project. I don't want to re-call certain names of dogs but although I see some good results, I think that there is still a lot to be done and it's complicated to achieve the level of best european dobermanns. I need to say that aspect which makes me worried is the character which I find average. There is genetical distance between character of european and american dobermanns. Nevertheless, I have always considered evolution as fundamental aspect of every breed development and I wish these breeders to eachieve their goals. M.J: Did you consider to use american dobermanns in your own breeding programme? M.S: Well, I thought about it but never had courage to do it. May be in the future. Never say never. Obviously, if I take such decission to mix with american line, it will be only because of breeding-potential of certain male. 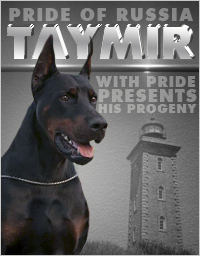 M.J: Character is one of the fundamental features of the dobermann breed. American-dobermanns in comparison to european dobermanns don't represent same quality. Don't you think that mix between dobermanns and american-dobermanns is irresponsible? M.S: I don't have knowledge to give valuable answer. I have seen dogs from american blood-lines who had character problems but I also think that there are some exceptions. 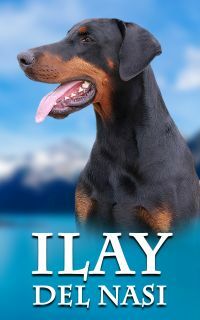 I would suggest to pay special attention to this aspect when one breeder takes decission to mix american and european dobermanns. This is my advice. 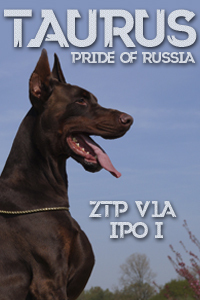 It is also a fact that in American breed is controlled by their own club which does not recognize official standard of Dobermann Verein. American standard recognize dogs who have lack of teeth. However, there is a Club in North America called ADA who acts accordingly to Dobermann Verein. I can not say with top certainty if official standard of Dobermann Verein is also recognized by UDC Club. I would like to underline efforts which are made in American with respect to official standard including organzing character test - ZTP. M.J: Since, you have mentioned the ZTP test. Do you think it has to be changed in order to become demanding? Today ZTP does not seem to be an achievement anymore. M.S: I think that we still need the ZTP test. I don't have in mind Germany or Italy where the quality of average character is stable for a long period of time. ZTP is needed in countries where it has short tradition of only few years and there is obvious reason to keep this test active for several years or even more. Personally, I consider Korung test as a goal to be achieved in breeding. This is great proof of dobermann quality by all standards. 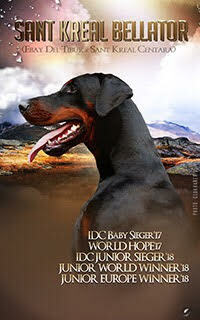 I would like to see future where major dobermanns and stud males which are used in breeding have the Korung test passed. 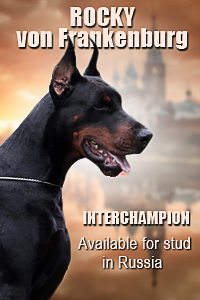 It will help to eliminate the division within dobermann breed on working dobermanns and those who have the "look". This ways of divergence is completely wrong and stay in opposition to breed standard. M.J: Future of dobermann breeding is in danger due to cropping and docking ban which is now being spread to other countries. We all know what it caused to dobermann breed in countries like Belgium of The Netherlands. 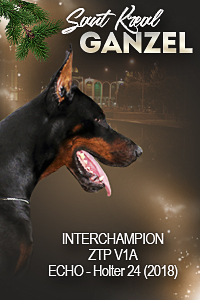 Will we see in the nearest future Diamante Nero dobermanns with long ears and tails? M.J: Actually, Doberman Verein as a country of origin has right to change standard. Is it necessary to do the change? M.S: We will know the anwer once the standard is changed by DV and the FCI. Till that period of time we will see both cropped and natural dogs. Of course, if you would like to hear my opinion, I prefer "status quo" and keep it how it is so we can see both cropped and natural dogs. This is my own opinion. When standard is changed I will adjust to new realityy but as I said before, from my egoistic point of view, I hope that it will happen as late as possible. 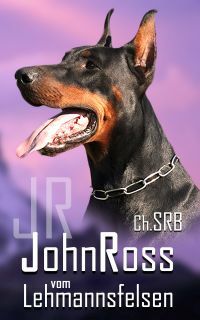 M.J: Do you think there are some other threats for dobermann breed? What do we have to do to work and develop? M.S: I think that the work which was done over last 30 years in terms of character (thanks to ZTP test) definitely improved the quality. There is no doubt that this work has to continue with same committment and spread ZTP test to all countries where this selection method is not in use. The real concern about dobermann future is DCM what I find as a real plague. We will face this problem and do whatever it takes to overcome this issue. It is worth to emphasize that some clubs (e.g A.I.A.D) already took actions to isolate and work on his problem. I'm sure that such initiatives will cause that we will be able control this terrible disease. M.J: Today we can evaluate how stud males like Gino Gomez del Citone, Graaf Quirinus v. Neerlands Stam, Baron Nike Renewal or Fedor del Nasi influenced on the breed. What is Urbano's contribution into modern dobermann? 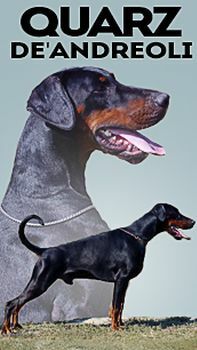 M.S: Graaf Quirinus v. Neerlands Stam in 80/90s was great result of Hertog Alpha v. Le Dobry genetic and created two essential lines for further evolution of modern dobermann. His two the most representative sons were Gamon di Campovalano and Jivago v/h Wantij. Even today we can see their genetic signals in the most important pedigrees all over the world. At the beginig of 21st century the new quality was brought by Gino Gomez del Citone, Baron Nike Renewal and of course Nitro del Rio Bianco. It is clear for everyone that the continuation of these dogs today is following: Ale' Alamos del Citone for Gino Gomez del Citone, Urbano del Diamante Nero for Nitro del Rio Bianco and Fedor del Nasi for Baron Nike Renewal. I'm convinced that further breed development in next decade will be focused on genetics of these three males. M.J: Before you said about matings strategy of Urbano with different females. Today the new is - Toscano del Diamante Nero who already started his career winning youth sieger titles e.g World Dog Show. As son of Urbano and grand-son of Fedor, for which females he might be taken into consideration? M.S: Let's start with saying that our Toscano will be a new stud after he has passed the ZTP test. Now it is too early to talk about him, he is youngster. As you can see, in Italy it is common, although not necessary, to match together only dogs who passed the ZTP. This is example of breeders awareness and it deserved respect. 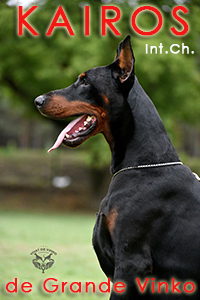 M.J: What can you advice to new dobermann breeders? What qualities breeding female must have? M.S: It is absolutely fundamental to start breeding with female who is well-defined in her genotype and with female of well-mixed blood-lines. I remember how in 80s I bought founder of my kennel - Julia v. Nymphenburg (Gildo v. Jura - Berenike v. Nymphenburg) when she was at the age of 2 years. It was a big financial effort for me but I took this decission. Prior to purchase, I did a research in previous years and realized that what I want is a solid foundation in order to design the future of my kennel. I had to start with female well established in genotype and it appeared to be a good base. I recommend to young breeders not to be in a hurry, to study first the pedigree to have understanding how certain results work out. Also I advice to visit important shows and if it is possible to make friends with important breeders - to learn from their knowledge and experience. Only after above mentioned steps, there comes a time to buy a good breeding-female and begin this fantastic adventure.